Eggplant Salad recipe by Mirza at PakiRecipes.com. 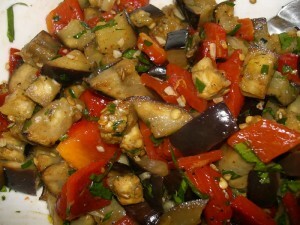 This eggplant salad recipe is absolutely delicious and makes a great side dish or an appetizer. Bringle(baigan ) 4 med cut in cubes. (grind all the above dressing ingrediens together it should have liquid consistancy and amount of vineger should accomodate bringle and tomatoes. Deep fry the bringles until they are golden brown and remove all the excess oil. Mix them with tomatoes in serving dish and pour the dressing over it allow atleast an hour to absorbe all the ingredient. Dont forget to sprinkle salt over it according to taste.